There are many ways to heat your swimming pool and each offer their own merits and faults. Arguably the best way you can heat your pool is with a heat pump, either air source or ground source. Of course, you may be asking yourself if you need to bother with heating your swimming pool at all. Regardless of you pool being indoors, outdoors or inground or not you really should consider a suitable heating source and here’s why. Does my pool need a pump? Everybody should be proud of their swimming pool. They are expensive and great to have, use and even just aesthetically pleasing to have in your home. One negative point is that you can’t really use them if during the cold months and this can seem like an incredible waste, after all, there’s no real reason why you could not use it all year round. Warm water is comfortable and inviting, cold water is not (unless you are particularly drawn to swimming in cold water) for most people. Warming your pool up during the cold months is easy, in fact the process is automated by most manufacturers of heat pump such DSL and Waterco who are amongst the leading designers/manufacturers throughout the world. There are a variety of methods and of course we have already mentioned that we recommend you heat using a heat pump. But before we get to the reasons why let’s just take a quick look at the alternatives. All of the above have high installation and running costs and this is why an air source or ground source heat pump can be a much better solution. 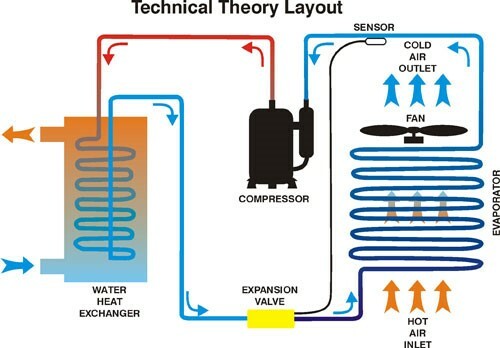 How does a pool heatpump work? You have a variety of ways that you can heat your pool that will enable you to use it throughout any month of the year regardless of the time of year. Some are expensive and difficult to install and can damage the environment whilst the most popular method of using a heat pump is a superior choice by far due to the low cost, easy install, easy of use and green tick in the box. There are many installers of swimming pools that can install your heat pump for you. To find a reputable installer you can use the swimming heat pumps section of the Paramount Pools website who are the number one importer of swimming pool equipment in the UK.